Watertown senior Gabby Venezia passes to junior Ally Kennedy in the State Semifinal in Braintree, as senior Olivia Lampasona looks on. 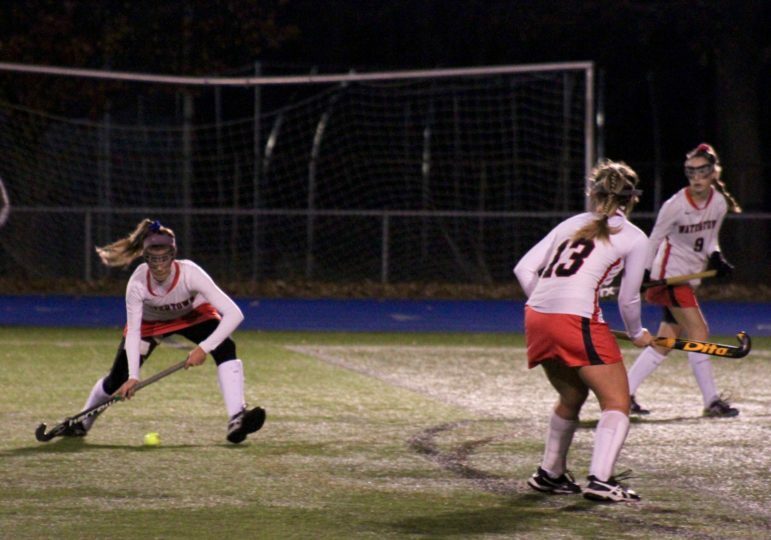 BRAINTREE — Something happened Tuesday night for the first time since George W. Bush was in the White House — the Watertown High School field hockey team lost in the State Tournament. The Raiders’ nine-plus year, 49 game State Tournament winning streak ended with a 2-1 loss to Dennis-Yarmouth in the MIAA Div. 2 State Semifinal. 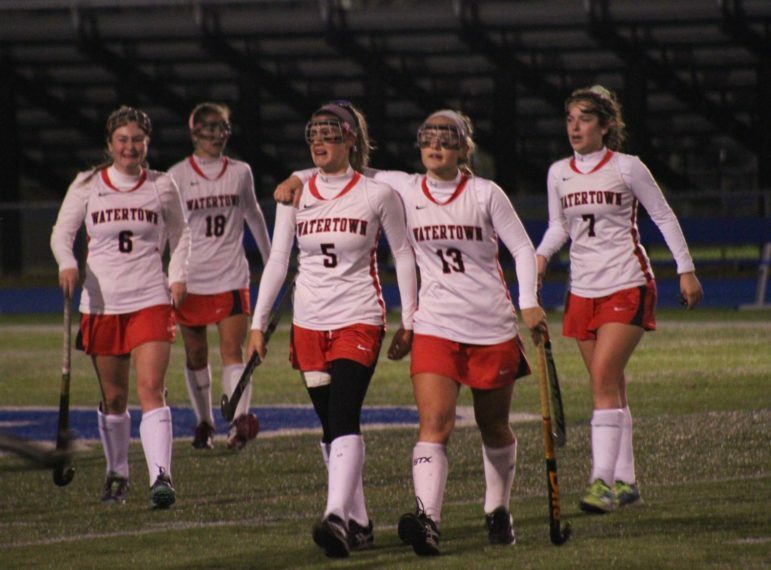 After one-goal wins in the past two rounds, Watertown again found itself in a dogfight. The Dolphins strategy of packing in on defense and playing for a counterattack frustrated the Raiders in the first half. One of Dennis-Yarmouth’s forays into Watertown territory resulted in two straight corners. On the second, D-Y senior Lucy Agurkis scored unassisted with 18:42 left in the first half. 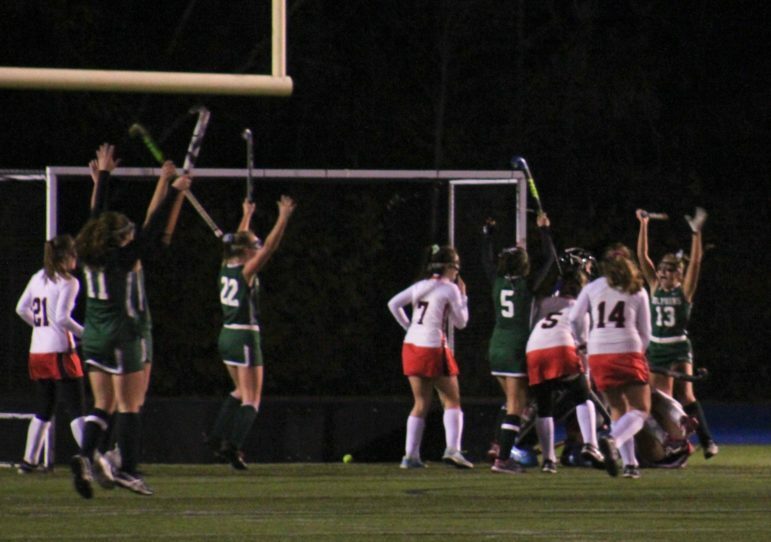 Watertown’s field hockey players celebrate after Olivia Lampasona scored to tie the State Semifinal on Tuesday. In the second half, the Raiders appeared to be on another comeback. After multiple shots, and a corner, Watertown earned a penalty corner when a shot struck the leg of a Dolphin defender in front of the goal. Junior Ally Kennedy’s shot, however, was blocked wide. The Raiders would not back off, and they got another corner. This time senior Olivia Lampasona knocked in a pass from Kennedy to tie the game up with less than 15 minutes left in the second half. Dennis-Yarmouth celebrates after taking the lead over the Raiders late in the State Semifinal on Tuesday night. The teams went back and forth, but it was Dennis-Yarmouth junior Abigail Hicks who broke the tie with a goal on an unassisted shot with 3:13 left in the game. The Raiders threw all its players forward, and got a penalty with about 2 minutes left. It took several attempts, but the Dolphins ended the threat when the ball rolled over the end line off a Watertown stick with 1:15 left. The clock ran down, and for the first time since the Raiders seniors were in second grade, Watertown was eliminated from the tournament. Instead, Dennis-Yarmouth (20-0-3) will be headed to Worcester on Saturday to face Greenfield in the State Final. 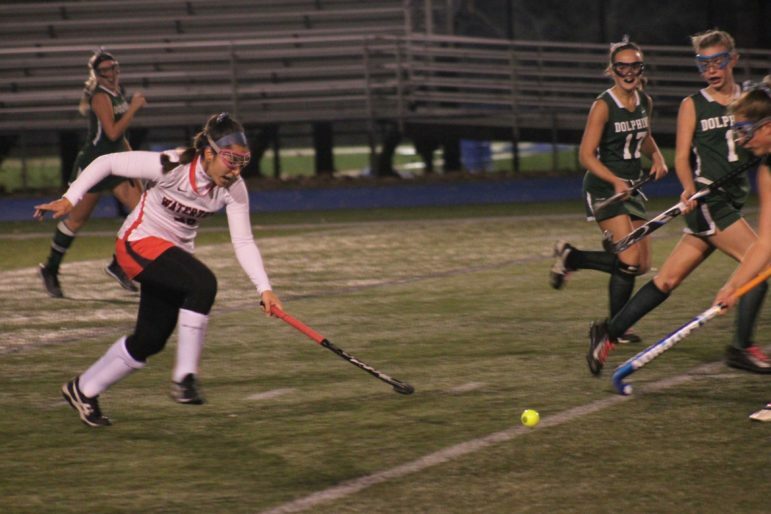 Watertown sophomore Christina Zouein chases a ball against Dennis-Yarmouth in the State Semifinal in Braintree. While Watertown will not defend its State Title, Watertown Head Coach Eileen Donahue remained proud of her team. With the loss Watertown finishes the year with a record of 20-1-1. The Raiders’ last tournament loss also came in the State Semifinal, a 3-2 loss to Hopkinton in 2008. The only other loss over that span was when Watertown lost a regular season game at Winchester last season. Donahue said, however, that she liked how her team fought to the end. The seniors end their career with three State Championships, four North Section Titles, four Middlesex League Freedom Titles, were part of the team that broke the national record long unbeaten streak in 2015, and had a career record of 87-2-1. 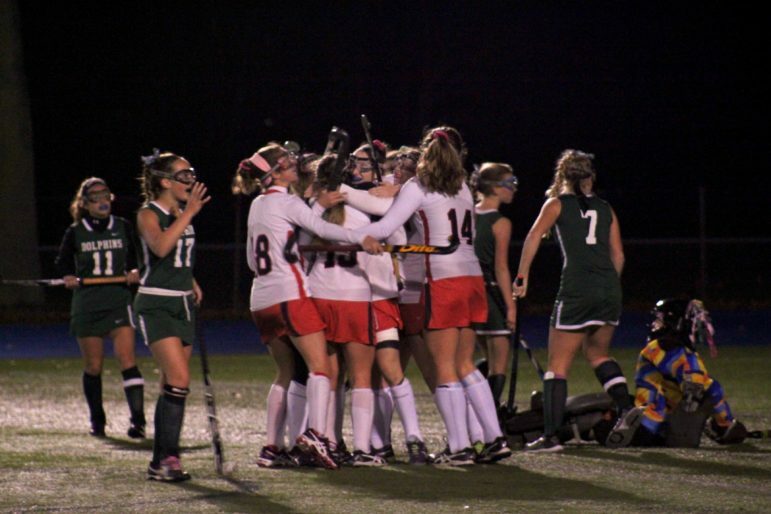 Watertown field hockey players leave the field in tears after losing 2-1 to Dennis-Yarmouth in the State Semifinal. A great run at another State title! Great job Ladies!